If you happen to own an iPhone, you probably store all you music on your iOS smartphone, and when you have a party you probably use your iPhone dock to dish out that music. But if you really want to get that party banging you might need a piece of kit that lets you become your own DJ. 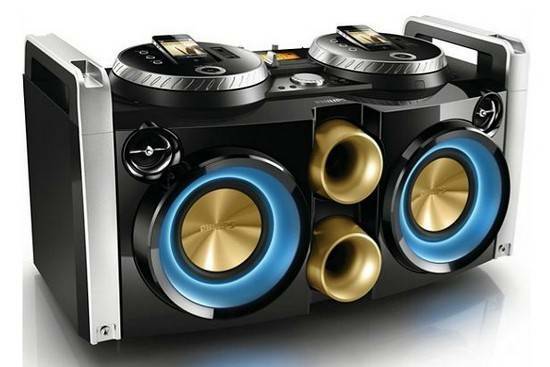 This is where the the Philips FWP3200D iPhone DJ Dock, which is an iPhone powered party machine that pushes out a whopping 300 watts of power via two 2-inch tweeters and two 5.25-inch woofers according to the guys over at iDownload Blog comes into its own. The Philips Mini Hi-Fi system features two iPhone docks set into the DJ turntables that enable the user to play their music, whilst charging their iOS smartphone, along with mixing and scratching music from the handsets libraries as long as you throw in an iOS app such as djay. Apparently the Philips FWP3200D iPhone DJ Dock also features a dynamic lighting system that delivers multi-coloured lights around the speakers that flash in sync with your tunes, and just so you can check out what the Philips FWP3200D iPhone DJ Dock has to offer, we have embedded a video for your viewing pleasure below. However, if you do what to rock you party as a DJ, the dual iPhone dock is going to set you back a bit of cash, as the Philips FWP3200D iPhone DJ Dock is available from the Philips website, and commands a price tag of Â£299.99, which is roughly 470-bucks, but unfortunately the device is currently only shipping to the United Kingdom. However, unless Philips has somehow allowed for a newer design iOS smartphone, this little piece of kit could possibly become a bit obsolete when the iPhone 5 arrives.